As Big Ag continues its efforts to conceal the truth about how animals suffer on factory farms, the ASPCA and advocates continue our counterattack to protect the public's right to know what goes on there. "Ag-gag" bills, conceived and pushed by the agricultural industry to criminalize undercover investigations on factory farms, have been introduced in nearly half of all U.S. states. These measures are intended to silence factory farm whistleblowers -- removing protection from vulnerable animals who need it, and giving it to powerful corporations who hide behind it. This week, we launched #OpenTheBarns, a rallying cry of advocates representing interests as diverse as animal welfare, food safety, workers' rights, environmental protection, and civil liberties. On Facebook, Twitter, Instagram and other social media avenues, groups like Food and Water Watch, the Government Accountability Project, the Socially Responsible Agriculture Project, and the National Consumers League are sharing their reasons to #OpenTheBarns. Even some farmers are part of the movement, because those who have nothing to fear have nothing to hide. They include Maryland's Carole Morison, the whistleblowing chicken farmer who was featured in the documentary Food Inc.; Georgia farmer and American Grassfed Alliance Vice President Will Harris; and Oregon farmer and Socially Responsible Agriculture CEO Kendra Kimbiraskas. Average Americans are also speaking their minds, because these issues matter to them. In a 2012 poll, 94 percent of the American public agreed that "from every step of their lives on a farm, farm animals should be treated in a way that inflicts the least amount of pain and suffering possible." In the same poll, 71 percent of American adults said they support undercover investigative efforts to expose farm animal abuse on industrial farms, and 64 percent opposed making such investigations illegal. In a 2014 poll, 81 percent of consumers said that chickens -- the farm animals most often raised for food -- should be humanely raised. That alone covers 9 billion animals. Celebrities and members of Congress are also adding their voices to the dialogue, including Portia de Rossi, Martha Stewart, and Rep. Rosa DeLauro (D-Connecticut). One reason this alliance is so large is that animal abuse isn't the only unethical activity Big Ag is trying to keep secret. 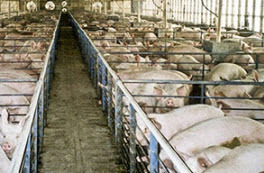 Documented investigations of factory farms have revealed unsafe conditions that endanger workers, shoddy food safety practices that put consumers at risk, and practices that ravage our environment. Ag-gag legislation can even shield puppy mills, which can fall under the category of "agricultural activity" in some states. Whistleblower revelations play an important part in reforming corrupt institutions. Decades of undercover investigations -- the very kind these ag-gag laws are trying to suppress -- have led directly to critical milestones including the passage of the federal Meat Inspection Act, the Pure Food and Drug Act, and the eventual establishment of the federal Food and Drug Administration. They have also led to reform in corporate practices and criminal liability. A broad coalition of advocates, including the ASPCA, has helped defeat more than two dozen ag-gag bills to date. Despite this, Big Ag is showing no signs of letting up. There's just too much money to be made. In the first few months of the 2015 legislative session, ag-gag laws have been introduced in nine states, most recently North Carolina, where ag-gag proponents are making their third try in three years. We have to keep fighting these laws and exposing their motives, for the welfare of the animals, but also for our right to know the ultimate price truly being paid for the food on our plates. So please add your own voice to the #OpenTheBarns campaign, and tell the agricultural industry that animal cruelty -- anywhere, for any reason -- demands sunlight, not secrecy.